reminders and most of the books, but the Bibles are indispensable. extra-biblical books, linked lexicons and parallel windows. And the price couldn't be better: Free. Like many free programs, the best utilities are dispersed all over the web. 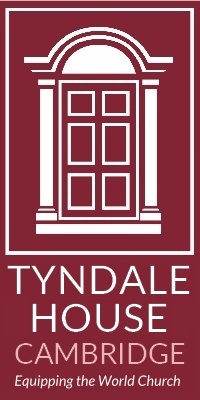 So I have collected my favorites together into a Tyndale Kit for BiblePlus on Palms. you get one with Palm OS5 and an SD card slot (for extra memory). * lots of scholarly Bibles & tools - all FREE. Not always the best, but very good. * English translations: ESV, RSV, WEB (modernized ASV) and lots more. * Aramaic Targums (Neofiti, Ps.Jon. & Onkelos) and English translations. * Syriac NT (& English) in easy-to-read Hebrew font and English translation. or Greek Josephus with English translation, or Hebrew OT with LXX. You can also search, keep bookmarks, and append notes to passages. match with the texts, but I've done all the work for you - see below. at Chan's wonderful site at http://www.thechan.com/ and get some more. If you find this free software inadequate, there are lots of packages you can buy. Should you get a Palm or Pocket PC? 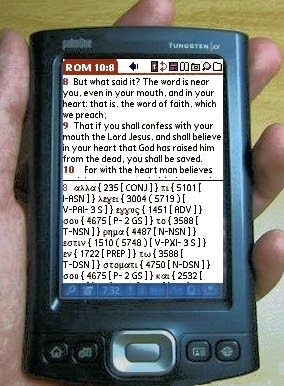 * BiblePlus is only available for Palms though other (costly) software works on both. with Word & Excel, and Wordsmith even shows TTF Greek & Hebrew fonts. your photos on a large bright screen. (Some Pocket PCs also have SD). (if you don't have all these, use the earlier versions of BiblePlus. The guide prices were the cheapest on Froogle.com and Froogle.co.uk in March 2006. Most are cheaper in the US, some are cheaper in the UK. I don't know why. very cheaply on eBay, sometimes new with guarantees. Sony Palms have wonderful features, but can be difficult to find outside Japan. - ie the Tungsten E2, T5, TX and Treo 650.
a week before your birthday. - click Next, Next, tick 'Show Extracted Files', and Finish. area of the Palm Install window. and repeat no.3 for Lexicons.zip. These three fonts work well together. You can try other mixtures. Don't enable too many at once, because they can conflict with each other. - start PPI, select RoadLingua as the program to look up, and click Save. - start Plucker. Go to the menu Options: Preferences: Lookup. Select "Look up in PPI." and tick "Double Tap PPI"
To see cross-references, double-click on the verse number. or on a Latin word in the Vulgate. If RoadLingua opens in the wrong dictionary, change it. Click on "Hide" to return to BiblePlus. Chumash - Torah + Rashi's commentary.